Click on a mini screenshot for a full screen view. 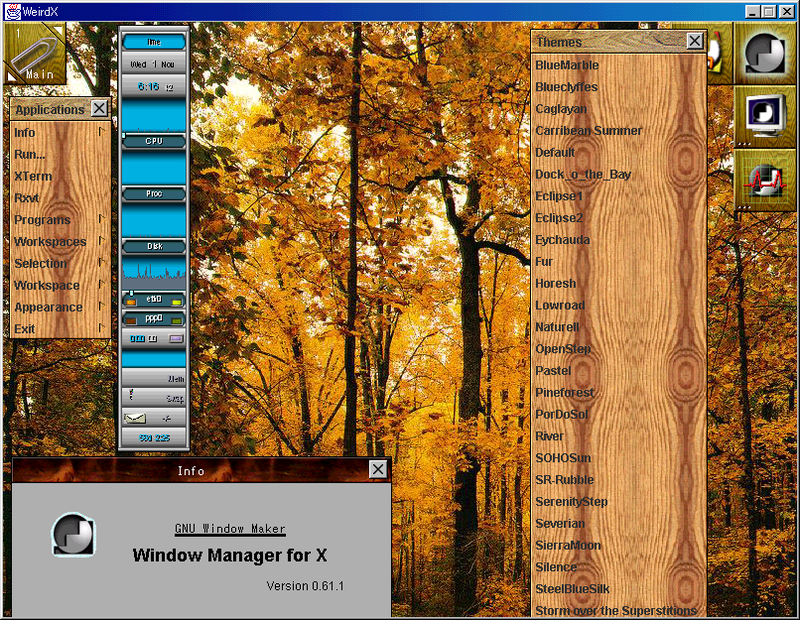 Koldeway, Jason J. sent us a nifty screenshot, where xmms was running on WeirdX&JEsd&win2k pro. I have not asked him explicitly, but I have guessed that the (raw PCM)sound stream was sent from GNU/Linux box to win2k box and successfully sounded from his desktop speakers. This shot was captured on WeirdX 1.0.25. WeirdX was running on IE 5.5's built-in JVM and the sigend WeirdX was used. Since this release, XDMCP support has worked correctly on JVM of IE, so gdm was used to login to KDE desktop. Mike Lundy sent us a nifty screenshot. It seems X clients are running on Cygwin. He said as follows. The screenshot was taken from my home PC running Windows 98. WeirdX is running as an Applet under MS Jview 5.00.3319 (IE5.5 Java runtime). A full installation of Cygwin (latest) is installed, along with Xfree86. I compiled x-povray from the UNIX sources available on their site. 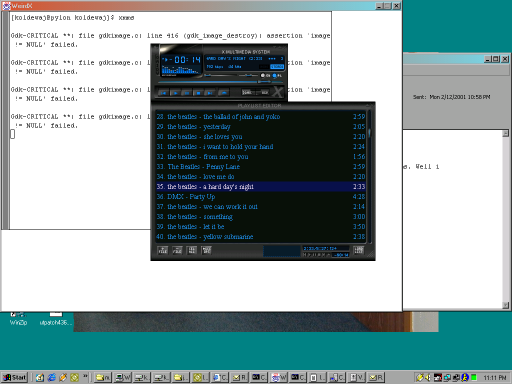 The window manager is FVWM2 (default theme), compiled again on this PC under GCC. Until WeirdX 1.0.22, there were bugs in GetImage request handling code. For example, gimp on WeirdX could not handle font glyph image correctly. As you can see, now gimp(1.1.26) can create clear font images, thanks to TrueType fonts. 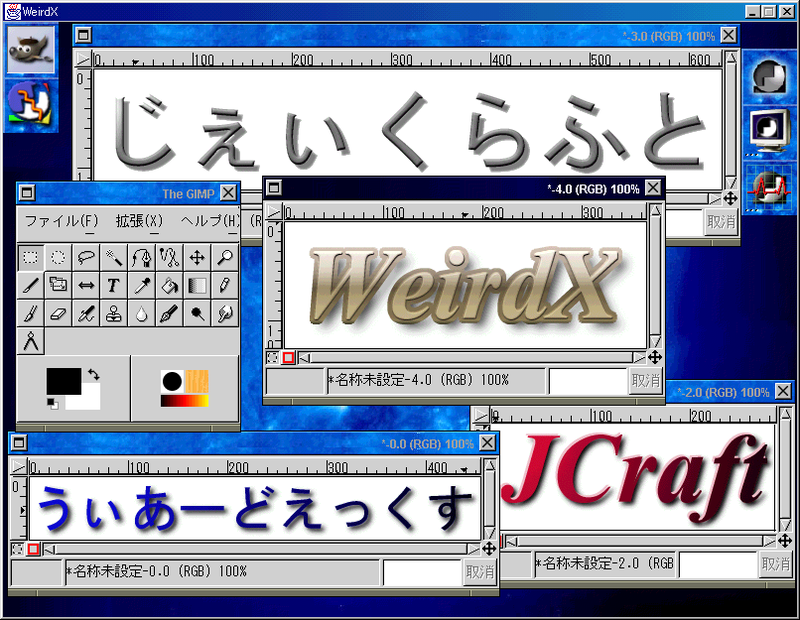 This shot also hi-lights that gimp on WeirdX can handle TrueType font images of JISX0208 characters. 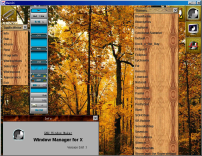 The WindowMake(with theme horesh) on WeirdX 1.0.21, J2SE 1.3.0, Windows98SE. In 1.0.21, some bugs in processing 'ClearArea' request were fixed and backgrounds of title-bars and menus are now rendered correctly. 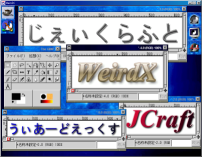 If you had been disappointed in WindowMake on Weirdx, try WeirdX 1.0.21 or later. This screenshot hilights the slight improvement on the previous hack for the alpha transparency on WeirdX 1.0.13, J2SE 1.3.0, Windows98SE(24bit colors). The alpha channel values for the background of windows have been variable according to those background pixel value. 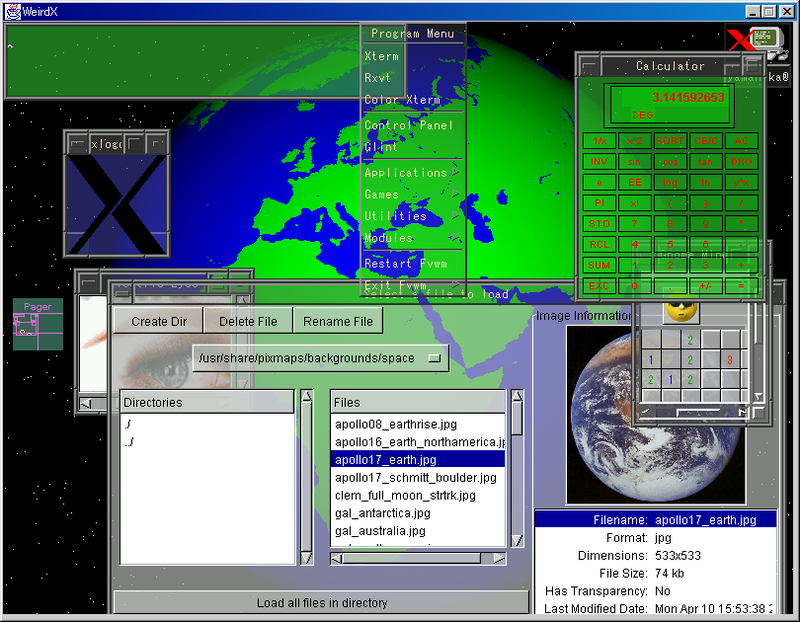 In this shot, 'fvwm', 'xconsole -bg green', etc. are running and the property 'weirdx.display.background.alpha' is specified as '0x00ff00:0x30, 0x0000ff:0x20, ...' . This screenshot hilights yet another hack for the alpha transparency on WeirdX 1.0.12, J2SE 1.3.0, Windows98SE(24bit colors). 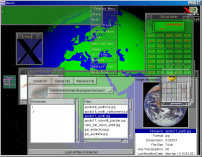 Every content of windows is rendered with alpha compositions. Unfortunately, this hack is based on Java2D API and is not so cool, but its performance is not so bad in comparison with the previous hack. So if you have J2SE 1.2. * or higher, it is worth trying. Many thanks to Jim Graham, who recommended me to use Java2D API for this hack. 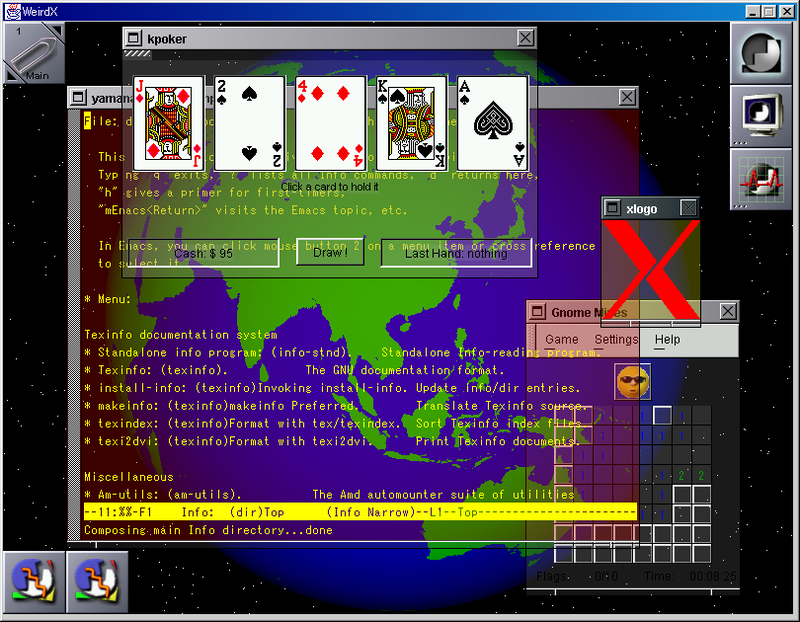 This screenshot was captured on WeirdX 1.0.11 with J2SE 1.3.0, Windows98SE(24bit colors). From this release, a hack for the alpha transparency has been added. 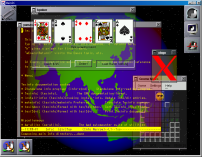 The property 'weirdx.display.background.alpha' is specified as '32' and wmker, xearth, xterm -fg yellow -bg red, xlogo -fg red -bg yellow, gnomine, kpoker are running on WeirdX. 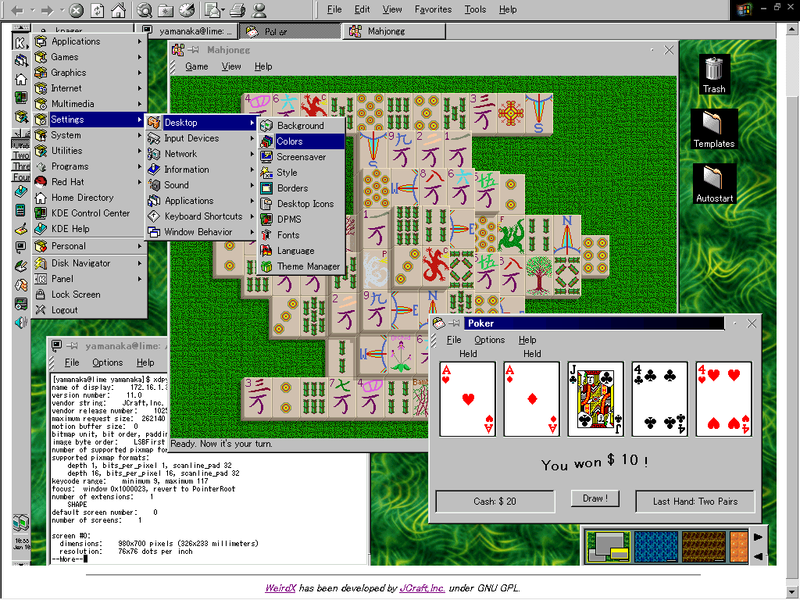 Note that backgrounds of xterm, xlogo are translucent and GTK widgets(in the default theme) in gnomine, and Qt widgets(in the default theme) in kpoker are also translucent. We can see the spinning of the globe through xterm. Have you ever seen such a desktop? Other screenshots are available here.